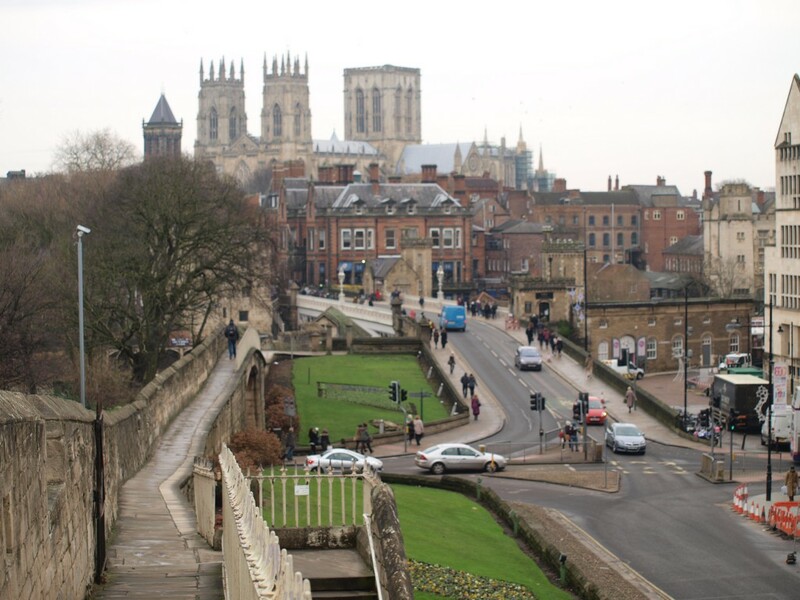 York still has most of the medieval walls that surrounded the city 700 years ago. The tops of these walls were partly rebuilt about 150 years ago so the public could walk along most of them –and feel safer by having a tall parapet on one side of them. Most think these are the best city walls in Britain, some say they give us the best city walk in Britain. In York –and in this guide –these are usually just called “The Walls”. Locals also sometimes refer to “The Bar Walls”. 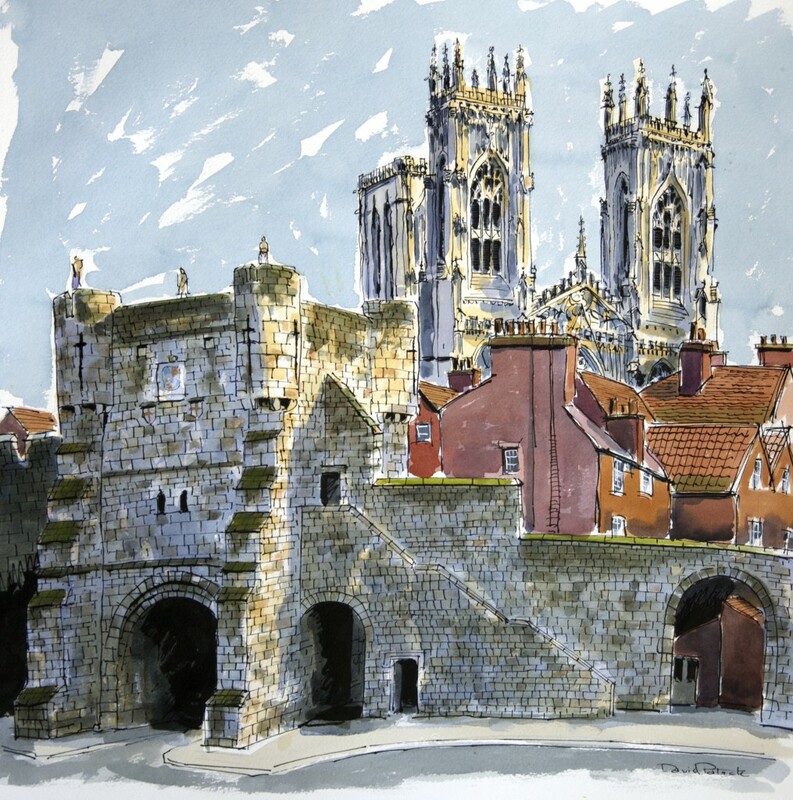 Whilst it is a common mistake to think that York’s City Walls are “Roman Walls” the walls you see today were mainly built in the 13th century of magnesian limestone and, uniquely in England, were set on earthen ramparts. This guide is to help you enjoy a circular walk that is on top of the Walls wherever possible. This guide can also help you select particular bits of the Walls to walk on because there are about a dozen places where you can climb up to [or down from] the Walls. 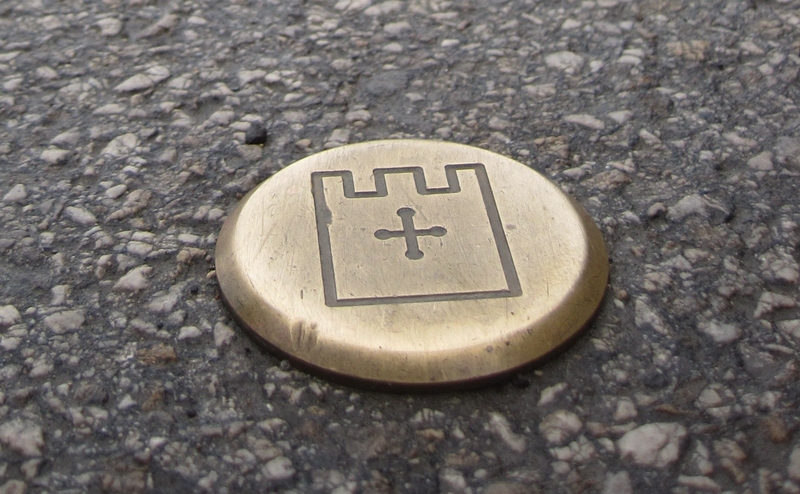 In this guide descriptions go clockwise on this “City Walls Trail” but the Walls can be walked in either direction. Information here mainly explains what you can see but there are a few stories of the sort that could begin “if you had been here in ….”. These are for those who want to know what these walls have “seen” even if these events have left no obvious physical trace for you to see as you walk the Walls today. Sadly, no section on top of the Walls is suitable for use in a wheel chair [there are steps to go up, then frequent steps and it’s too narrow for safe passing]; pushchairs create problems but occasionally people try to use them; dogs [other than guide dogs and assistance dogs] are banned. 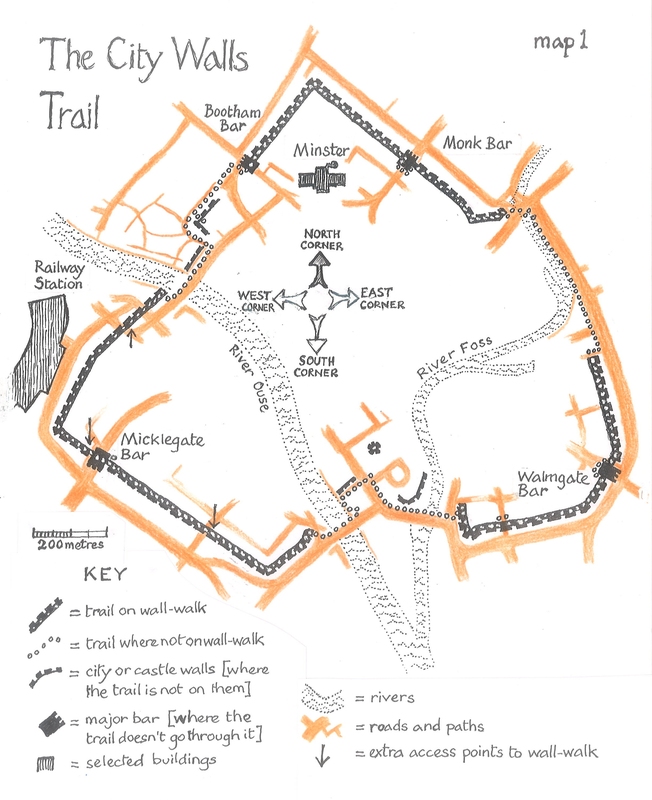 If you do wish to follow York’s City Walls Trail from ground level then see the map HERE + image after MAP 1. There are many sections where there are no railings on one side of the walk. Young children should be supervised at all times. 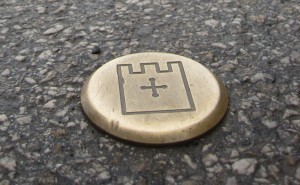 The route between the walks on the Walls is marked on the ground with small brass pavement studs showing a tower with battlements. This studded route is mainly on the flat, and the steps that do exist are avoidable. This route can be made into a fairly flat full circuit of the Walls –nearly always by going along the pavement on the Walls side of the roads which ring the Walls; these roads are often busy, some bits of the pavement are busy too -but there is often a good view of the Walls. A short [but very good] part of the studded route goes through the Museum Gardens, entry to these is free [summer closing is at 8.00]. You can walk either way round the Walls (but the following pages go clockwise); you can get up to them by stone steps at the four main bars, at the 3 minor gateways, at the four other places where the wall-walk ends and, oddly, from a sort of large island in roads 200 metres east of the railway station. Scan the QR codes to give links to the web pages relevant to their nearest wall-walk section(s). The information here was first compiled in the spring of 2013 and is continually checked and updated. Please tell us if you discover any mistakes or changes. 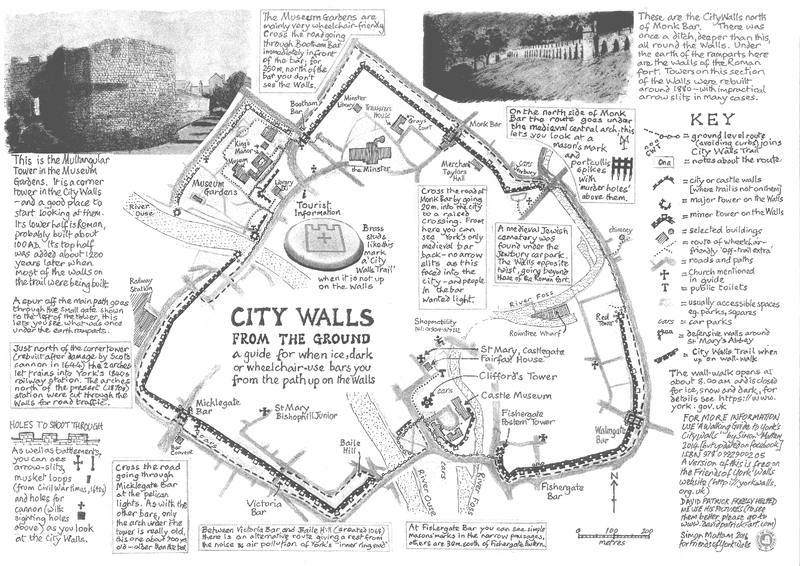 See “A Walking Guide to York’s City Walls” by Simon Mattam. Eboru Publishing – ISBN 978 0 9929002 0 5.